The WRWM-1517E is an ESD-Safe, EPDM Rubber Wash Mat. 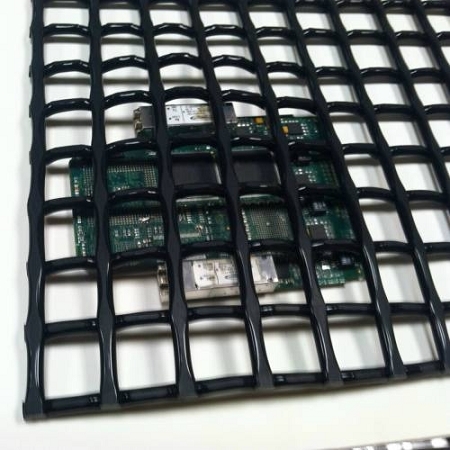 These mats are meant to prevent your delicate PCB's from bouncing around inside a wash basket during a batch cleaning process, protecting the PCB's from potential damage during the wash process. The WRWM-1517E wash mats are specifically designed for manufacturers in the Aerospace, Military and/or Medical fields where the presents of Silicon in the wash process may be detrimental to your products. The EPDM Rubber is your Silicon-Free Solution. The WRWM-1517E mats are constructed from EPDM Rubber, which is a combination of ethylene, propylene and a diene comonomer that enables crosslinking via sulphur vulcanization systems. This rubber is resistant to temperatures as high as 302°F (150°C) and as low as -58°F (-50°C). The EPDM is infused with an ESD filler, providing the ESD properties, offering a static resistance range of 10(8) ohms. The WRWM-1517E mats measure 15.25" x 17.25" x 1".